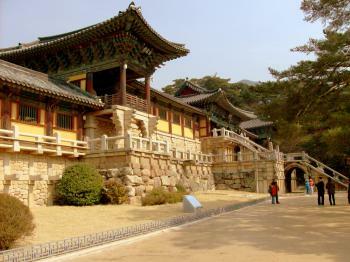 Seokguram Grotto and Bulguksa Temple are religious monuments and masterpieces of Far Eastern Buddhist art. Seokguram Grotto is a hermitage that is part of the Bulguksa temple complex. The grotto overlooks the Sea of Japan (East Sea) and rests 750 meters above sea level. It holds some of the best Buddhist sculptures in the world, including the main Buddha. Construction lasted from 742 to 774. The nearby Bulguksa Temple is the most famous Buddhist temple in Korea and the home to a number of important relics from the Silla period, including most obviously the two stone pagodas Tabot'ap and Sokkat'ap. It also dates from the 8th century, but has been rebuilt on a number of occasions. The Temple was added to the nomination on the advice of ICOMOS. Pulguksa Temple is one of the main points of interest in the Gyongyu-area, so it was full of (Korean) tourists. A picturesque place. 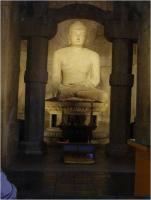 The Buddha in Sokkuram Grotto is a very delicate one. Three meters high, and very white. Unfortunately you can only see it from a distance (behind glass). Photos are not allowed. I visited here in fall of 2007. Located a short distance out of Gyeongju, the Seokguram Grotto and Bluguksa Temple are two completely different w sites put under the same world heritage banner. The Seokguram Grotto was a real disappointment. It is much more difficult to get to, sitting on the top of a mountain, and up a winding road. You have to walk about 10-15 min to get there, and when you do get there, it is a tiny alcove where you can’t take photos, and the Buddha is walled off behind glass. The Bluguska Temple, however, is the most impressive thing in the Gyeongju area. It was the best-preserved temple I visited in South Korea and is a rather large complex. 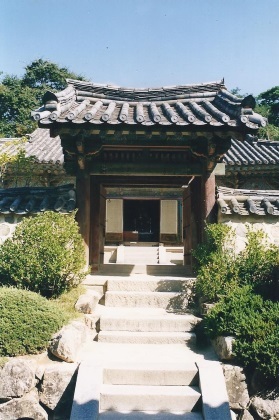 The above photo is the front of the Seokguram Grotto. Both the temple and the shrine can be visited from Gyeongju on a half day trip via taxi or organized tour. Read more about the Seokguram Grotto and Bulguksa Temple on my website. I visited this WHS in April 2017. Overall, I have mixed feelings on this WHS. I think that the Seokguram Grotto alone surely possesses OUV and is perhaps one of the only truly iconic sites in South Korea. However, it is very difficult to appreciate its outstanding value from behind a glass! I understand that it would be impossible to control the crowds without it, but at least a guided tour or specific time slot bookable online in advance shouldn't be impossible to organise. Being relatively small and just one 'grotto', in my opinion fuelled ICOMOS to suggest including Bulguksa Temple in this inscription, which is perfectly capable of catering for the crowds and possesses 2 important Silla stone pagodas among other relics. However, the majority of this temple has been totally reconstructed as recently as 1969-1973 so in my opinion it detracts rather than complementing the impressive grotto. Bulguksa Temple was originally built in 751 AD but it was burnt down completely during Japanese invasions in 1593. Some of the buildings were rebuilt but the whole temple was completely restored or reconstructed in 1969-1973. The most important cultural properties from the Unified Silla period are located on site including the 2 stone pagodas of Seokgatap and Dabotap. The former is a 10.3 m tall three tier stone pagoda which was restored in 1925 and contained in its interior what is believed to be the world's oldest example of woodblock print. 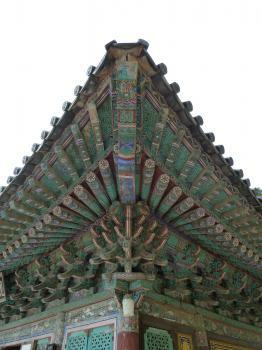 It is quite similar to the one found on top of Tohamsan Peak (1.4km from Seokgoram). It is in distinct contrast with the more elaborate Dabotap. The Dapotap stone pagoda is truly unique and can be found on the 10 won coin. Only one of the four lions at its corners can be seen on site. A second one can be seen in the British Museum. A small part of the stone railings has been slightly damaged during the strong earthquake which occurred in Gyeongju in September 2016. Another interesting relic which caught my attention was an intricately carved stone lantern next to the Geungnakjeon Hall. All in all, however, I was quite disappointed with Bulguksa Temple and wouldn't advise anyone to go on a crazy day trip to Gyeongju and Bulguksa from Seoul as some local and international tourists do. On the other hand, Seokgoram grotto is an extraordinary cave temple manually built 1200 years ago during the Unified Silla period. It was inspired by the cave temples of India (Ajanta) and China (Longmen and Yunggang) but it differs in many ways. The cave temples in India and China were built in areas of soft sandstone or limestone hills and the carvings were made directly on the rocks of several caves over time. Seokguram embodies the ideal harmony of science, art and religion in a single entity as one complete project. Korea is full of solid granite mountains and hills, making it impossible to build cave temples in a similar manner. New construction techniques had to be developed in order to build the Seokgoram grotto, an artificial cave structure to house the temple. More than 360 enormous blocks of granite were used to build the temple, inserting a lead fastener between the stones that was immaculately carved out to support the sheer weight of the granite stones. The geometrical shape has been meticulously calculated with a margin of error of only 1 in 10,000 which means 1mm in every 10 metres! This helps to get a sense of how precisely each stone was placed. Today, with modern precision tools, the margin of error stoneworkers aspire to achieve is 1 in 300 or 1mm every 30cm. In my opinion this aspect alone demonstrates the 1200 year old Silla architectural achievement and the OUV this site clearly possesses. Only the Inca temples come close to the granite construction techniques of Seokgoram but the Incas came 700 years later. The grotto is made up of a rectangular antechamber and a round main hall. The roof is made up of 108 stones (symbolically important and sacred number in Buddhism), without the use of mortar. It exemplifies the sense of unity in this building apart from the phenomenal accuracy. The most impressive feature is obviously the Buddha statue illustrating the achievement of Buddhahood by the Sakyamuni. The simplicity in the statue represents the liberation from all worldly attachments. Although granite is a hard coarse grained rock, the Buddha statue and the surrounding figures contain vivid and detailed features. I bought a very interesting DVD and a book on Seokgoram and I'd really love to visit its interior one time. When I visited, there was a Buddhist monk chanting and Buddhists prostrating inside, so I could easily take a couple of photos while nobody was watching. Each site has a UNESCO WHS stone marker in Korean next to the ticket booth so you cannot miss them. It is the most peaceful but also very sad place due to the Japan's invasion. We've lost lots of heritage and even in Seokguram Grotto the statue's middle of the face, there was a jewelry, but it was taken. Its a nice place to visit. Seokguram Grotto and Bulguksa Temple form one of the most famous site in South Korea. 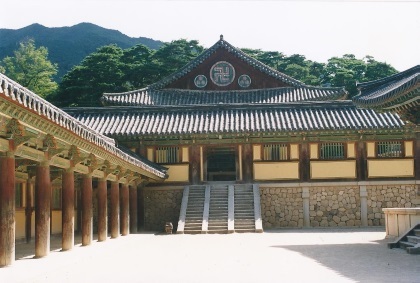 Bulguksa is a Buddhist temple completed in 774 by kings of Silla Kingdom (located in Gyeongju). The complex has been destroyed, and rebuilt in 1604. It has been renovated several times since there. It is home to seven National treasures of South Korea, whose the two famous stone pagodas (Dabotap and Seokgatap). 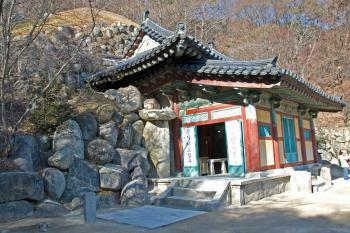 The Seokguram Grotto, is located four kilometers to the east, on the hill. You can go there from the temple either by walk through a beautiful forest way, hiking the hill, or by bus. The hiking will take you almost one hour but the frame worth it. The Grotto is almost located at the top of the hill, 750 meters above sea level. As in the entrance of Bulguska temple, The Four Heavenly Kings guard the corridor. Its construction began in 742 and was completed in 774. The Buddha statue it welcomes exemplifies one of the best Buddhist sculptures in the world. The Japan sea is visible from this place when clouds are not too present. These two sites were a rather pleasant way to start my exploration of South Korea. I started at the small Seokguram Grotto, I was impressed by the quality of the carving inside. It is very small but of a high quality, reminding me of my visit the previous year to Ellora. After this brief viewing it was a lovely stroll back down to Bulguksa, the 2,5km walk led me through some lovely forests which were starting to show the first colours of autumn. Bulguksa was a pleasant temple to walk around with some fine examples of wooden architecture and some rather lovely painted panels. There were lots of Korean children running around and practicing their English on me which was nice, but it was also easy enough to get a little peace and quiet when I needed to by sloping off to the other side of the tranquil ponds dotted around the sanctuary. These were a lovely way to start my WHS collection in Korea, and an easy and worthwhile afternoon trip from Gyongju. This review is made after my second visit to one of most outstanding temple in South Korea, Bulguksa Temple and its nearby Seokguram Grotto which in my opinion one of the must see World Heritage Site in this country. I still remember my first visit in late spring 2008, Mount Tohamsan, where the temple complex is located, was in full bloom of spring color with hundreds of paper lantern decorating for the upcoming Lord Buddha's Birthday festival. I visited Seokguram by taxi from the city of Gyeongju, the tiny grotto was very popular for tourists and I had to queue to see the famous Buddha statue. The statue claimed to be the best for Korean art but it was behind the glass scene with some bad light reflection, so hardly to admire this great work. After Seokguram I decided to hike down to Bulguksa Temple, the hiking path was lovely, highly recommended, the forest was full of maple trees, the autumn must be very gorgeous, I even told my friend that one day I want to come back to see autumn foliage at Bulguksa Temple. When I reached the temple, which is considered as one of the three most important temple in the country representing the Lord Buddha, I was quite shocked to see hundreds of tourists in the temple, I hardly had time to appreciate the temple, that why I much preferred Haeinsa, another WHS temple of Korea. But in late summer 2011, I had a chance to revisit Bulguksa, and this time the atmosphere was totally different, the temple was much less crowded; maybe most of locals went to see the Cultural Expo which hold in nearby Bomunho Lake. I had more time to appreciate the art of the temple and agreed that Bulguksa was in the same league of other famous East Asia Buddhist temple in China or Japan. 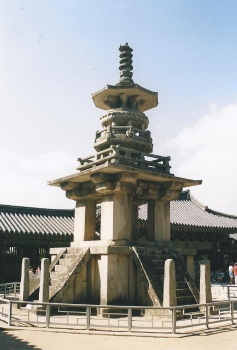 The highlights of the temple were its unique stone stairway and two lovely pagodas, both were built during Silla Kingdom. Although the authenticity of the temple is quite disputable, as the temple has been destroy many times and the current structure is the result of archeologists' imagination forty years ago. But I have to admit that the restoration did really good and the temple became a masterpiece of architecture with countless details for admiration, and made me curious what Gyeongju looked like during its peak time. All in all, I really enjoyed my second time in Bulguksa Temple; it is the place to fascinate the Korean art better than any other temple in South Korea. As I mentioned I hope one day I will have a chance to see the temple during autumn foliage, revisit Bulguksa for the third time is still a welcome idea for me. 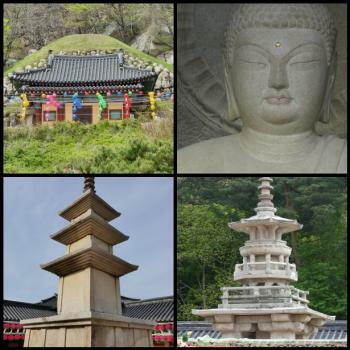 A trip to Gyeonju is not complete without a visit to these two Buddhist treasures. Seokguram Grotto is a masterpiece of Silla Artistry, while Bulguksa is one of the best Buddhist temples in Korea. I visited both sites twice in 2008, both during Winter and Summer. I enjoyed both trips. Korea in general is often overlooked in favor of China or Japan concerning sights. Look a little deeper into Korea, you might not only be suprised, but happy you travelled to a destination that is so rich in cultural heritage. Seokguram Grotto is a masterpiece of human artistry, that rivals some of the great masterpieces of Chinese art and sculpture. I have spent time at Bulguk-sa on two occasions, one winter evening in 2003 and one gorgeous wunny day in 2004. It left me feeling peaceful. I have spent time at Tongdo-sa and walked away with the same feelings of inner peace and tranquility. I visit Korea frequently and make a point of spending time at as many shrines and temples as possible. Bulguk-sa is my personal favourite. It is a testament to the Zen tradition and to the rich heritage of the Korean culture. It is picturesque and exquisite. Sokkurum is also beautiful but brace yourself for a wild bus ride up the mountain (walking is probably less scary)!!!! I would urge anyone visiting Korea to visit Bulguk-sa, Haein-sa and Tongdo-sa. They encapsulate the Zen faith and Korea. 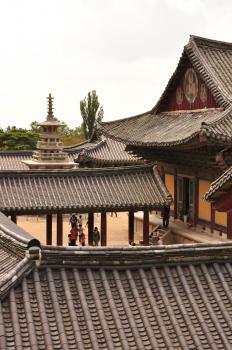 To understand Korea, you had better visit one its Buddhist temples and Pulguksa is one of the most beautiful. The grounds are lovely and serene and there are areas where one can easily meditate and pray. Temple buildings are colorful and lavashly decorated. (I remember the temple complex being remarkably quiet and visitors were respectful and reverent while touring.) The stone pagodas, unique to Korea, are strange and mystic. And the Sokkuram Grotto is a remarkable site for people of all faiths. (Too bad its behind glass.) This is a wonderful place to visit while in the Kyongyu vicinity. From "Sokkuram Grotto" to "Sokkuram Grotto and Pulguksa Temple"
Mathematical Concepts: Seokguram Grotto - Projective Geometry. Projective geometry is the study of mathematics dealing with properties of figures that is invariant (doesn't change) with projective transformations. Seokguram Grotto demonstrates the practical knowledge in projective geometry of the builders. Viewed from around 10 meters (current location with the glass door), the grotto is eye-level with the visitor and with balanced in principle with projective geometry. The halo is constructed as an ellipse but after geometric projection around 8-10 m, it looks round from the observer. The dimensions of the two hands are constructed differently due to the distance difference between them. When viewed from observer, the hands look perfectly balanced. Same principles is also applied to the dimension of the head in relation to the body. On Passports: Inside of passport (right side) shows Dabotap, one of two famous stone pagodas in Bulguksa Temple. Built elsewhere as a full size replica: Dabotap and Seokgatop in Gyeongju's Bulguksa Temple have been constructed as full-size replicas in North Korea to be visited in a Heritage Park. 120 Community Members have visited.